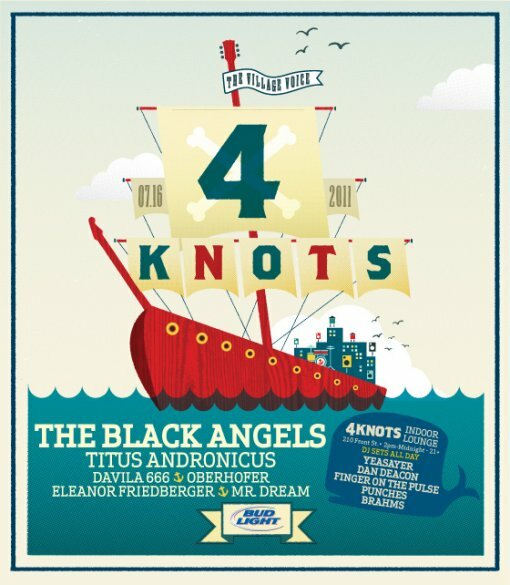 The inaugural Village Voice presented 4Knots Music Festival will take place this Saturday (July 16) at the South St. Seaport with The Black Angels and Titus Andronicus topping the bill. In addition to the FREE outdoor stage, the festival has added an indoor DJ lounge which will be held at 210 Front Street, just around the corner from the Pier 17 main stage. “The 4Knots Indoor Lounge” will be open from 2:00PM – Midnight with free admission to 21+ guests only. Festivities get underway at 1PM at Pier 17 the South St. Seaport, show is all ages and rain or shine. View the full 2011 4Knots Music Festival main stage and indoor lounge lineup after the jump.